Eleven little school girls are quietened by their teachers wish to go to the park and think about death. They do not like the thought of death but Miss Renshaw is in charge and they must do as they are told, just as she asks them not to talk about their meetings with Morgan the gardener at the Ena Thompson Memorial Gardens. However this day their trip takes them farther, into the caves by the coast and when the girls get scared and leave the cave Miss Renshaw does not follow, neither does Morgan. Waiting and waiting the girls make their way back to the school alone and try not to tell on Miss Renshaw, but how long can they keep quiet? how long can they keep her secret? And what even happened that day? Is Miss Renshaw ever coming back? This was a strange little book but a fantastically interesting one all the same. Sent in the late 60s on an Australian Island The Goldne Day really took me out of my comfort zone in terms of location and time period, but it kept me intrigued wight he mystery surrounding a lot of things and I think it would be a great read for many. The story follows the Eleven little girls as they go down to the Gardens and into the cave then return to school and the fallout of them being alone and Miss Renshaw going missing. Told from the perspective of the girls in third person, and mainly from the point of view of Cubby – one of the eleven, its a bit of a strange narrative because you don’t get everything. The girls must only be between 7 and 9 (its never actually stated) so the reader gets everything they get but obviously their mind works differently to an adult or older child’s and they don’t get told everything, they only get snippets. This makes things strange and exciting and also quite terrifying and you see a lot of this through the story. The characters are really well described and I liked that each girl had their own personality, with Bethany the crier and Icara the smart, realistic one. I also liked that the girls had different reactions to teachers and parents. As every things through the girls there were bits that I wasn’t clear about until very late on like the Amanda thing from Cubbys point of view, but that all cleared up in the end. There is an element of the supernatural with this book and I liked that it didn’t switch around completely and become a supernatural book. It is for the most part a kind of coming of age story about mystery and seeing things you shouldn’t, telling lies and keeping secrets but with a dash of ghostliness within the pages. I loved the last few chapters especially because of this and I loved that these showed just what that day when Miss Renshaw disappeared did to the girls and how it affected them. I would recommend this book, its a quick read and it works really well as a YA/adult crossover. The time period and setting take some getting used to if you are not familiar with them but because its a drastic time for change during the period, with the Vietnam War raging and social aspects to do with women and class changing, it makes for a great story. 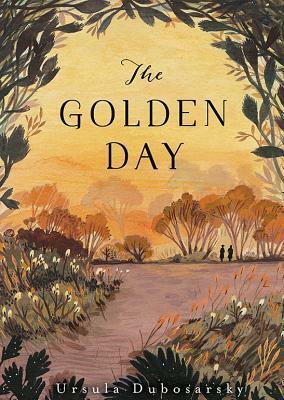 The Golden Day will be published by Walker Children’s Books in August 2014. My copy was the American hardback copy which was published in August 2013 by Candlewick Press, Walker’s US partners, and was given to me at the Walker Blogger Event.